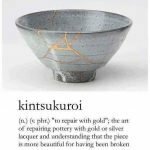 I learnt a new word and I love the sound of it: kintsukuroi. 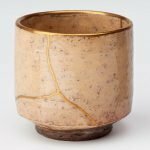 It is the Japanese art of repairing broken pottery with seams of gold. 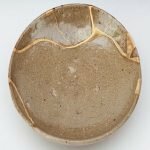 Kintsugi repairs the brokenness in a way that makes the container even more beautiful than it was prior to being broken. Not a very common idea in western culture! 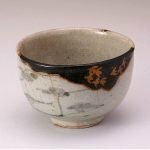 Instead of diminishing the bowl’s appeal and appreciation, the “break” offers the container a new sense of its vitality and resilience. 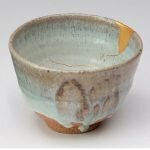 The bowl has become more beautiful for having been broken. One can say that the true life of the bowl began the moment it was dropped! 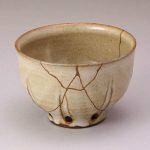 Imagine you are that clay pot: celebrate your flaws and imperfections. Remember that you being you is what makes you uniquely beautiful. 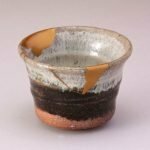 An interesting essay on the art of kintsukuroi can be found in Flickwerk, The Aesthetics of Mended Japanese Ceramics. I’m pretty sure that I’ve reblogged this before, but its actually one of my favorite posts on tumblr. The idea that something can be more beautiful after being broken is so moving to me. I kind of want one of these someday, or to make my own. It’s an amazing concept, and I love the fact that it’s an artform. It’s like what happens to your heart when you finally meet someone that treats you with real love and respect and repairs your broken heart with their golden love and affection.